A model for a complete first order theory T in a language of finite type is minimally saturated if it is recursively saturated and elementarily embeddable in every recursively saturated model of T. Such a model is unique when it exists, and may be regarded as the smallest model of T with saturation properties. (Alternatively, if T* denotes the theory obtained from T by adding all Σ 1 1 -sentences consistent with T, then a minimally saturated model for T is simply a prime model for T*). 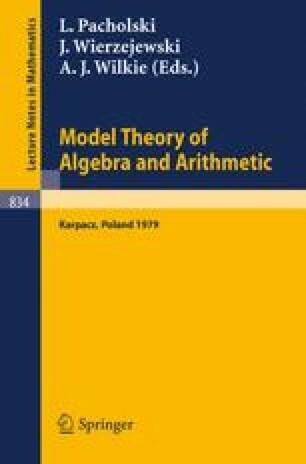 We show that the existence of such a model is implied by the existence of a countably saturated model, and in turn implies the existence of a prime model, and that both these implications are strict. We also give an easily applicable sufficient condition for T to have no minimally saturated model. §3 includes a general result about the degrees of complete types of first-order theories.